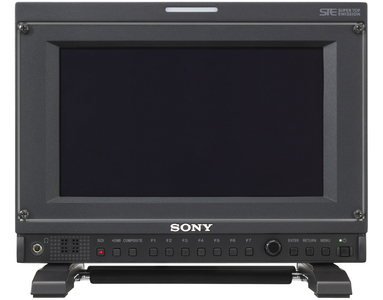 One of the things that really caught my eye at NAB was Sony’s new PVM-740 field monitor. This is one of the first professional monitors to use OLED technology (Organic Light Emitting Diode). Traditional LCD screens work by using a backlight that has a liquid crystal panel in front of it. When a charge is applied to the liquid crystals they change the polarisation of the light passing through them, this light then passes through a second polariser and between them they vary the amount of light passing through the panel to the viewer (If you have ever seen a VariND filter or tried twisting one polarising filter relative to another you can see how this works). While on the whole this works reasonably well there are some issues with this technology. The first is that the liquid crystals never fully block the passage of all the light, so black is never truly black, some light always seeps through. In addition brightness is limited to that of the backlight and the light is attenuated as it has to pass through the crystals and polariser. In addition if the backlight is too bright then the blacks get brighter too which limits the overall contrast range. Another issue is that LCD’s take time to change state from on to off and off to on. This leads to lag and smear with fast motion or high refresh rates. While a lot of money has been spent over the years developing LCD technology and there are some excellent LCD monitors available, these issues still exist and LCD performance still lags behind that of CRT’s. Enter OLED. Organic Light Emitting Diode displays use a grid of light emitting devices, each pixel is a separate emitter, so when it’s off, it’s truly off. This means that blacks are completely black. When the emitter is on the light it emits is not passing through a polariser or crystal so it’s brightness is not diminished, this means that whites are really bright. In addition you can switch an LED on and off pretty much instantly so there is no lag or smearing. When you see the new Sony PVM-740 OLED monitor side by side with a similar LCD monitor the difference is striking! It’s like looking through a window, the image is clear and crisp, blacks are… well.. black and whites are bright and sparkle. The pictures from the PVM-740 are much more like the images you would expect to get from a top spec CRT monitor, yet the 740 is light weight, compact and uses less power. It should also be more robust and will not be affected by magnetic fields like a CRT monitor. You really need to see this monitor in the flesh to appreciate the images it produces.